Gloria’s children, Rayni and Austin, enjoy homemade playdough with their friend Heidi. For weeks or even months, we’ve all been waiting for the day that Grandpas would come with plans to stay for a few weeks. The day had actually arrived. Excitement reigned on all sides. How long do we have to wait until Dawdys (the German word for Grandpas) get here?” Austin asked for the tenth time. The minutes were on a count down. “They could be here in two minutes,” I informed him. At last, Daddy spotted the minivan turning in the driveway. “Dawdys are coming! They’re here!” the excited little onlookers chorused from their perch just inside the window. They all crowded closer, eager to catch the first glimpse of Grandpa and Grandma. “There’s Mary!” Rayni declared. Ah, obviously it had just been wishful thinking as Aunt Mary couldn’t come along this time. It so happened that it was raining and chilly and there was no way the children could go out to meet them as they would have liked. Daddy slipped into his ever faithful clogs which he wears in basically any weather through-out the four seasons. Sprinting through the April weather, he went out to help them unload while I tried to convince the children that they really will come in the house in only a couple minutes. After unloading everything, their driver headed back for Ohio once more. At last the long-awaited moment arrived as Dawdys came walking up the sidewalks. Next came the usual hugs; sweet little Jesse could hardly stop hugging Grandma. It was obvious that even though he’s only 18 months old, he remembered her from our last visit to Ohio. We were off to a good start. After Daniel had helped them carry their luggage downstairs, we were ready to eat. I had prepared a simple supper for all of us to dine together. That first evening we could just barely talk fast enough as we went from how things were going in their busy lives to our foster children and how Julia and Austin enjoy jump roping. The children were thrilled to show them their latest accomplishments with jump roping and were especially impressed when Dawdy joined them, jumping like a boy at heart! After a while, we decided that there really is no good reason to all get to bed too late since we had enough days ahead to spend more quality time together. The next day was Sunday school, so Dawdys walked the half mile to church with our little family. Daniel showed them how we fit three or four children into our double stroller on walks such as this. It was so good to have Dawdys along, the sun shone warmly, giving invigoration as only a Sunday morning can. Returning home after an inspiring Sunday forenoon we made and served the Yoder standby menu after Sunday school of pancakes, oven baked omelet and juice. The week ahead unfolded beautifully as Dawdy helped Daniel and John in their woodworking shop and Grandma helped me in the house and on several occasions accompanied the children and me on a walk up to the store and out to the shop to watch the men. Half of Dawdys’ stay was spent with Daniel’s brother John and his family. Julia and Austin teased Dawdys, telling them that they should surprise Johns by just not going to their house at all. The children’s highlight of having Grandma here was the day she made a huge batch of homemade play dough. They eagerly helped her count out amounts of various ingredients as she measured and stirred. When the finished product came steaming from the kettle we were all impressed. Not only were there little hands but also grown-up fingers in the dough shaping all sorts of dough-y objects. From dinner rolls and cookies to building a pond with fish and ducks, it was fun for all of us . Aunt Mary recently told me how she and her cousins would go to their Grandma’s house and spend hours making play dough dolls wrapped in blankets, drinking their bottles or placing them in their little beds, all made of play dough. It certainly is a pass time that can occupy little ones for hours. With our youngsters I’ve noticed that at times they just need someone to help them get started, then once the get into the groove of using their imagination untold possibilities can unfold. Yesterday Julia and Austin helped each other make hundreds of little play dough balls. Now how about taking the time to mix up a batch of this soft home made play dough and watch a child’s eyes widen with delight as you present this small, but creative gift to them? Place all dry ingredients in a sauce pan, stir then add wet ingredients, mix together. Next stir constantly over medium heat until mixture thickens to dough consistency. Remove from heat. Now rub a small amount of vegetable oil on your table top and knead dough on it, until smooth. It will be hot at first, letting it set for a few minutes will be fine. The oil will keep it from sticking to the table. As long as it sticks to the table you may work some oil in, only a little at a time; you will notice that as the dough cools, it’ll also be easier to handle. This is a non-toxic play dough that will last for months if stored in an air-tight container. Great grandma, who shared the recipe, says having children wash their hands before playing with play dough will allow dough to keep it’s color longer. 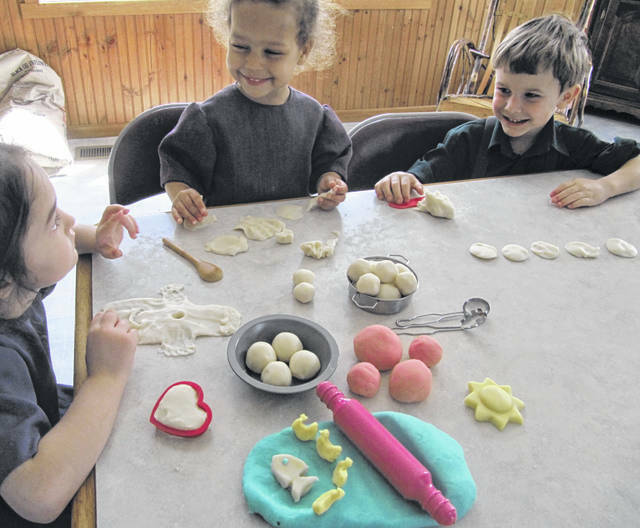 https://www.recordherald.com/wp-content/uploads/sites/27/2019/04/web1_IMG_0191.jpgGloria’s children, Rayni and Austin, enjoy homemade playdough with their friend Heidi.